As a photographer you know that the presentation of your images to your clients makes all of the difference in the world. You must certainly also know that it's almost impossible to find a well made leather photography album anymore. The quality of most all leather albums and portfolios available today can be more than a little bit disappointing. Well, that's not the case when you order your custom or personalized leather photography album from Powell Leather. We craft our beautiful leather photography portfolios from the highest quality materials available anywhere to create books that are as durable as they are handsome. Your photography portfolio may be personalized with your own art on the cover, and crafted from the leather of your choice. We would be pleased to speak with you to find out what the purpose of your book will be, and how it will be used before we begin so that we might create something truly special that will be in your service for many years to come. If you're looking for a handsome leather presentation portfolio to demonstrate your products or services to your customers we can help. We have crafted beautiful leather sales portfolios for a wide variety of applications ranging from professional photographers and manufacturing companies to investment firms, interior designers, and landscape architects. We can craft a beautiful custom leather portfolio from your choice of leathers, place your name or logo on the cover, and even stitch in document sleeves and pen loops to give your sales team the the ultimate sales accessory. Please feel free to give us a call anytime to discuss how we might craft a custom leather presentation portfolio for you. You may also be interested in browsing our selection of leather guest books, wedding guest books, leather photo albums, 8.5 x 11 photo albums, photographer's portfolios, and other personalized and custom leather accessories. For whatever your purpose may be, we can create a custom leather photo album to accommodate your needs. No matter whether you're seeking a vacation photo album, family photo album, photography portfolio, or a sales presentation portfolio we can design the perfect personalized album for you. Please feel free to contact us to discuss whatever it is that you require. 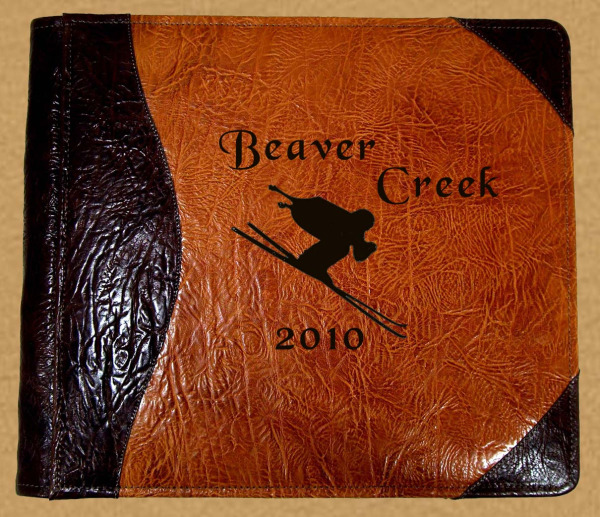 We will be pleased to design a personalized leather album that will work for you. It's difficult to find just the right style photo portfolio for every project. We can help. If you've got a special project, and are looking for a custom or personlalized leather photo album, photo portfolio, presentation portfolio, or photo envelope, we will craft one to satisfy your needs. Just give us a call to discuss what it is that you have in mind. We will craft your Powell Leather product from your choice of leathers, and develop a concept that will satisfy the look, and function, of what it is that you seek. All products may be personalized, and we have many options to choose from for interior features. Please feel free to browse our website, and give us a call anytime! More and more people are using their digital cameras these days, and this has created a great demand for 8.5 x 11 leather photo albums. The 8.5 x 11 photo portfolio is the perfect album to accommodate your digital photos printed at home. Documents and photos printed on standard printer or photo paper may be easily mounted within its sleeves. It is an excellent album for 8 x 10 photos as well. 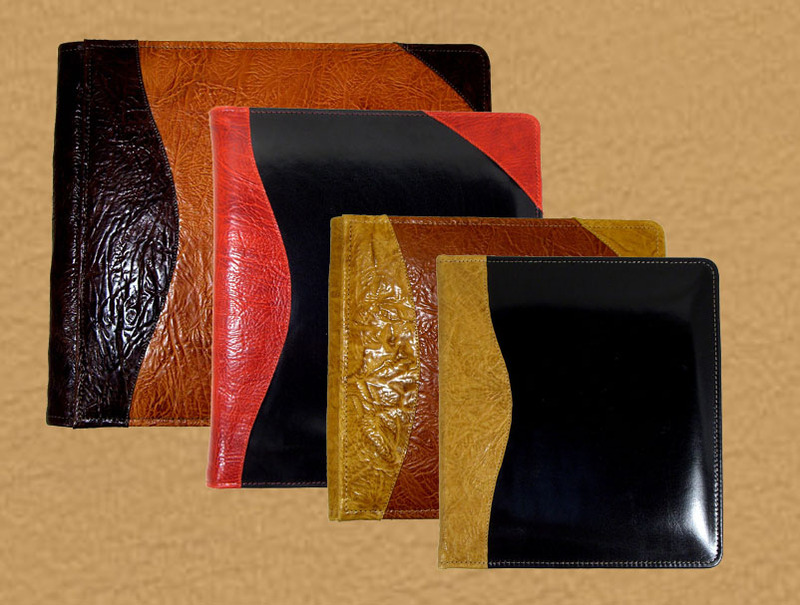 The album may be crafted from your choice of leathers, and personalized to suit your taste. The top loading pages are composed of ultra clear polypropylene photo sleeve film with heavy black archival card stock inserts within them for mounting your images. These albums are also popular candidates for use as sales and presentation portfolios. Optional document sleeves may be stitched inside either of the covers if desired. 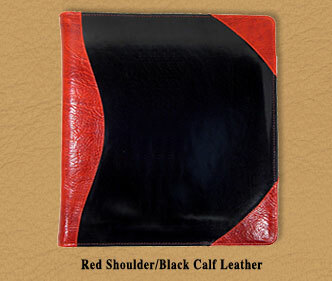 We will be more than happy to customize your leather photo portfolio any way that you like. 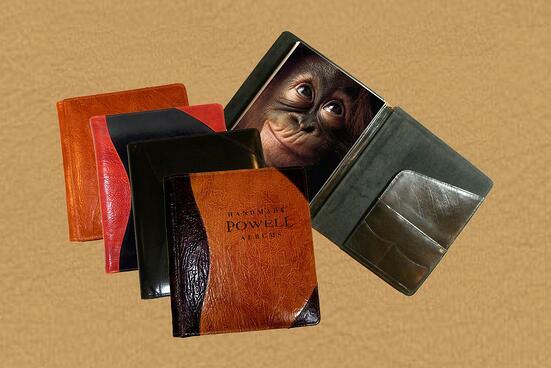 Call us to discuss a Powell Leather personalized photo portfolio crafted specifically for you.